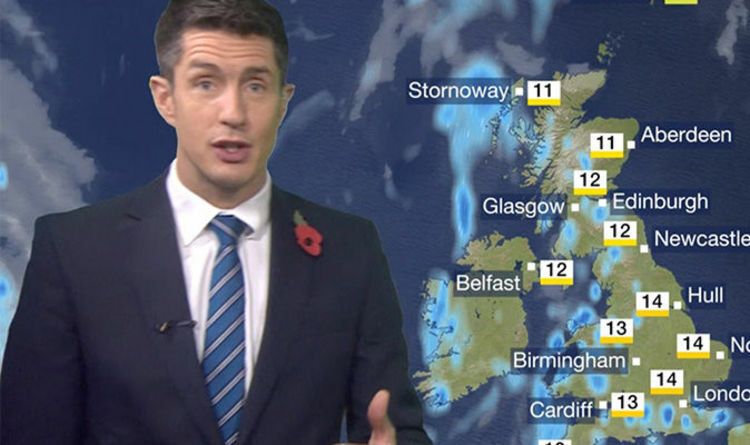 BBC Weather forecaster Chris Fawkes warned heavy showers will continue for many during the first half of next week, but southwesterly winds will bring temperatures up considerably as soon as Thursday. The BBC meteorologist forecast the arrival of some fog at the end of the week and plenty of sunshine between scattered showers across Britain. He said: “Into the early part of next week, often we’re going to see low pressure sat to the north-west of the British Isles. “That will continue to maintain southwesterly winds, so we are going to see further showers, it will stay mild but we will also get some sunshine. “On Monday, looking very similar weather-wise to this weekend with plenty of showers, some of which will be heavy and thundery. “Sunny spells in between those showers and the temperatures staying on the mild side with highs between 10C and 14C. “That mild theme to the weather is set to continue over the next few days. “Temperatures probably peaking in the London area at around 16C as we head on into Thursday. The high temperatures will follow days of heavy rain, strong winds and flooding as Storm Deidre leaves UK's shores. The Met Office issued severe weather warnings on Friday over fears homes and businesses were at risk of flooding. Falling leaves and blocked drains could also cause travel chaos as they may block the roads. Meteorologist Bonnie Diamond said: “A deep low-pressure system will move eastwards across the country on Friday bringing long spells of heavy rain and strong winds. “We are expecting some heavy, blustery showers through the day and there will be a risk of thunder; winds will be an issue and these could build to gale or severe-gale force.